Why See Toro Y Moi? 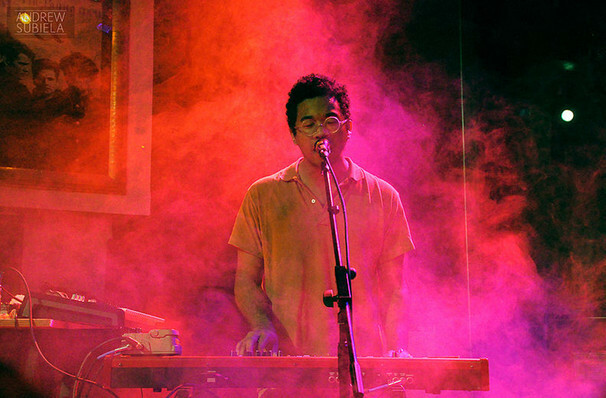 Where synth-pop, R&B and chillwave meet is where you'll find Toro Y Moi. Real name Chazwick Bundick, he's been creating his own idiosyncratic brand of indie music for over a decade now, whenever he's not busy with his graphic design work or electronic dance music project Les Sins. He's also in demand as a featured artist, popping on tracks from Travis Scott and The Avalanches. His latest record is Outer Peace, a commentary on today's consumerist culture and the power of corporations, that features yet more intriguing blending of genres. In their review of lead single 'Freelance', Pitchfork remarked, "Disillusionment has never sounded so danceable". Sound good to you? Share this page on social media and let your friends know about Toro Y Moi at Neptune Theater. Please note: The term Neptune Theater and/or Toro Y Moi as well as all associated graphics, logos, and/or other trademarks, tradenames or copyrights are the property of the Neptune Theater and/or Toro Y Moi and are used herein for factual descriptive purposes only. 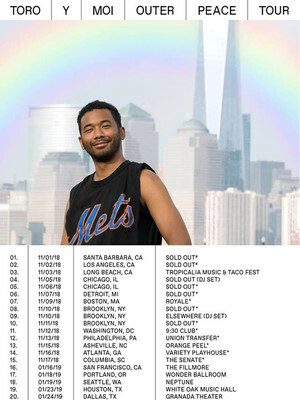 We are in no way associated with or authorized by the Neptune Theater and/or Toro Y Moi and neither that entity nor any of its affiliates have licensed or endorsed us to sell tickets, goods and or services in conjunction with their events.